For many people, a large Victorian house with huge rooms and high walls and ceilings is THE dream home, as these buildings often carry a certain prestige and image. Others, however, prefer lower ceilings in order to avoid the dreaded "hall ambience". In other words, high walls and ceilings are a question of taste (not to mention heating costs!). Wallpapers can play an important part in either visually reducing or deliberately emphasising high walls and ceilings. 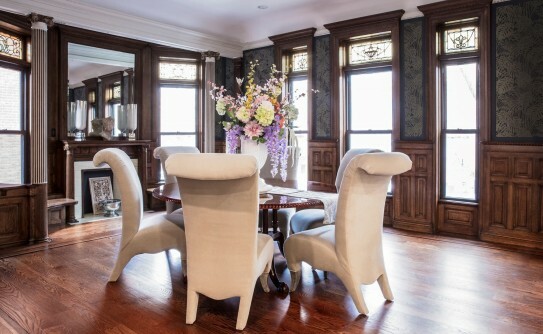 This Blog explains at what point walls or ceilings exceed the "normal" height, what we mean, in this context, by "old historic buildings", and which wallpapers help you introduce the desired atmosphere into a high-walled room. In addition we will touch upon the topic of listed buildings and their preservation - an issue that has to be considered thoroughly when it comes to any renovation projects. Independently of the year they were built, houses might be called "historic/listed buildings". More concretely, buildings with high ceilings and walls, large rooms, huge double doors and equally big windows were often constructed in the Victorian or Edwardian periods. They frequently feature architectural details from the Art Nouveau era and are older than 100 years. They were a symbol of the emergence of the middle classes and their new-found wealth. In representative metropolitan apartment blocks, the well-to-do created their very own small castles, based on the example of the aristocracy's luxurious dwellings. In order to demonstrate the power, wealth and superiority of the upwardly mobile, the rooms had to be high and spacious. And those buildings still carry a certain flair of exclusive luxury and prestige. When is a ceiling considered high? What is the "normal" ceiling height, at what point does one speak of high ceilings and what is the maximum height of walls and ceilings? For residential premises in new buildings, the minimum clearance height is 2.30 m. In many houses built in the 1960s, the ceiling height is between 2.40 m and 2.50 m. These measurements are considered "normal height", even though - depending on the type of building and the region - 2.80 m can also be called normal. The typical buildings from the Victorian and Edwardian era, however, feature ceiling heights of at least 3.30 m, some of them even go up to 5.00 m. In today's luxury new builds, the ceiling height tends to be up to 3.00 m, which is within the parameters of both comfort and energy efficiency. Should experienced DIY enthusiasts tackle high walls and ceilings themselves? That is a good question, but beyond a height of 3 m, the answers is usually a resounding "No". Wallpapering ceilings requires a particularly high level of concentration and physical endurance. Add the height aspect and it can become a dangerous situation for laypeople who do not have the necessary experience. As a general rule: Wallpapering walls and ceilings of a height that cannot be reached with standard household ladders should be left to professionals who will use scaffolding. Please refer to our wallpapering instruction How to wallpaper the ceiling which explains all necessary steps and provides useful tips. Rented flats or houses of a certain age can be listed and under protection/preservation orders. This is not necessarily connected to the year a building was constructed; other important aspects are architecture, style, cultural and artistic significance. 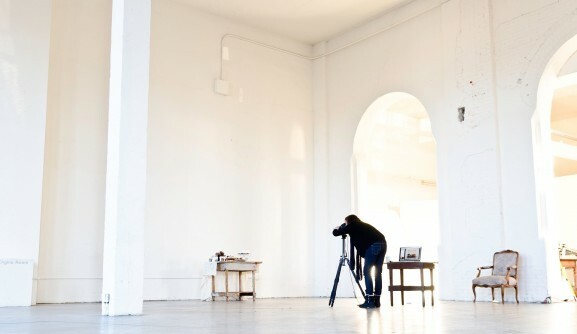 If you are planning to move into an old building which might be historically significant, it is recommended that you talk to the landlord or the previous owner about this topic. Alternatively, requesting the necessary information from the local council, the Office for Historical Monuments or the Building Authority will provide you with the answers you need. You might think: "Surely wallpapering walls and ceilings, even in protected buildings, can't be a problem!" But preservation orders are not limited to façades, windows and doors. Interior walls and ceilings can also be included, especially if they feature special and unique characteristics. To name but a few examples: wood-beamed ceilings, intricate stucco ceilings, walls made of special construction materials, or elements based on unique craftsmanship might all be protected. In order to avoid potentially high restoration costs and fines, the exact stipulations should be clarified before any renovation work takes place. The following tips regarding the use of wallpaper in historic buildings are all referring to rooms which are not subject to any specific regulations for the protection of listed buildings. Generally speaking, high walls are suitable for large-scale, opulent patterns and stronger colours. Horizontally aligned patterns are a good option to visually decrease the height. Diagonally arranged geometric and graphic patterns are also very suitable. Dark colours make ceilings in dizzying heights appear lower. However, they should always match the hues of the wallpaper. Wallpapers with darker colours visually "fill" a room and take away the dreaded "hall effect". Colourful, intense and bright hues in combination with an exuberant pattern distract the eye from a high ceiling. To visually lower the ceiling and make the walls look shorter, and depending on the pattern design, it could make sense to leave a gap between the wallpaper and the top of the wall. This is particularly true if the ceiling remains untouched or is simply painted in one colour. Dado rail elements, available in a large variety of materials and styles, can be used to create a clean transition between the wallpaper and the ceiling. Structure, relief or flock wallpapers with three-dimensional effects add movement to the ceiling, which distracts from the height. In a lighter contrasting colour, these wallpaper models work particularly well on ceilings when combined with darker wallpaper colours on the walls. The ceiling as a "solo performer": In narrow rooms with high walls, an extravagant patterned wallpaper, for instance with geometric shapes or lush flower bouquets in exuberant colours, can create an attractive ambience. The walls should be white or painted in a light colour. This visually reduces the height whilst making the room look wider. Another option to distract from high walls and ceilings is the use of two different wallpapers on the walls. To realise this concept, plain-coloured wallpapers can be combined with patterned models; two patterned variations can also work, as long as the colours and motifs are compatible. Where the two wallpapers meet on the wall is entirely down to personal preferences. It could be in the middle of the wall or at the top or bottom third - anything goes! A grand, elaborate patterned wallpaper in intense shades of purple, royal blue, gold or bronze is also a good choice for high walls and ceilings. Opulent, colourful or dark baroque, geometry or floral patterns are just as suitable as wallpapers with three-dimensional and depth effects. Designer wallpapers with delicate twig and flower patterns can grow along the walls and onto the ceiling, giving a room a cohesive appearance and adding a touch of charm. High ceilings carry huge creative potential when treated with sophisticated, glamorous and extravagant wallpapers. Lofty ceilings can be a real eye-catcher when turned into, say, a delightful indoors sky with enchanting pattern motifs. We have just the right designer wallpaper for your dream project! Wider dado rails under the ceiling provide a great contrast and will also draw the beholder's gaze upwards to the unique ceiling design. 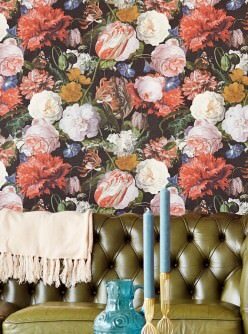 Walls can be stylishly treated with matching pattern, structure, nature, textile or metal wallpapers. This option isn't meant to reduce the height and spaciousness of a room, but to make the most of it, to exploit its full potential. In some cases, a creative ceiling design is all that is needed. Star-studded Universe: Glitter, sparkle, light-reflecting effects, play of colours, and holograms turn every glance to the ceiling into a "wow moment". 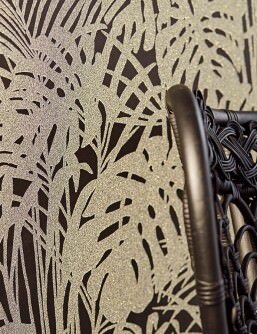 A plethora of effect foil and metal wallpapers with countless pattern choices is available in our Wallpaper Shop. The choice of wallpaper colours and patterns for high walls and ceilings should be aligned with the way the room is used. We generally differentiate between those rooms where more action occurs and those where peace and quiet is top of the agenda. In rooms which are subject to high levels of humidity, water- and steam-resistant wallpapers like non-woven or vinyl wallpapers are required. Our Shop offers a large choice of these robust models, in many colours and pattern variations. In commercial premises, the right wallpaper enhances the interaction with customers and clients and can have a huge (subconscious) impact on their willingness to buy products or sign contracts. Public spaces can be designed to improve communication or provide inspiration. 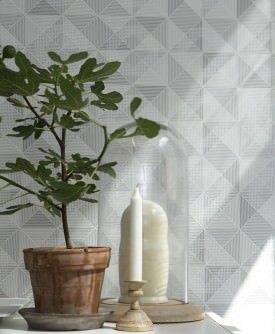 Our constantly growing Blog includes many articles regarding interior design options with wallpaper for different rooms in relation to their use. 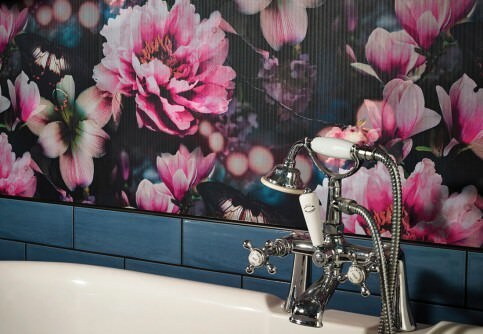 Depending on the way a room is used, wallpapers are subject to various levels of strain and wear & tear. For children's rooms, kitchens, hallways, stairways, and common or waiting rooms in public buildings, washable wallpapers are usually the better choice. The higher the walls and ceilings are, the harder it is to keep them clean, especially for non-professionals. This includes dry cleaning with dusters or vacuum cleaners. Up to a height of 3 meters, cleaning utensils with telescope handles or suction tubes are very useful; anything higher requires a scaffold ladder/scaffolding. Once the ceiling and the top of the walls show first signs of visible dirt, it's time to call in the professionals. Dust, dirt particles or nicotine often collect high up on walls and ceilings. A good way to prevent staining is to ensure the room is aired on a daily basis. A lush flower bouquet and gorgeous butterflies in a large-scale, photo-realistic depiction with a subtle stripe structure: non-woven wallpaper Aurelia comes with a highly wash-resistant vinyl surface and turns any room into the Garden of Eden; we can almost smell the scent of the beautiful flowers. The dot matrix, which forms the 3D pattern in black and grey, is only visible at second glance. Cleverly used shading creates triangular shapes which feel distinctly three-dimensional and plastic. A glorious challenge for the senses. Versace stands for luxury and design of the highest perfection. 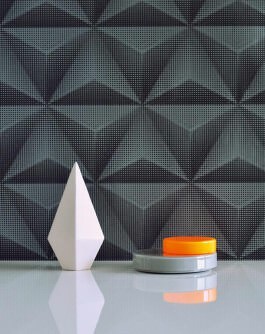 The subtle geometric lines on our wallpaper Solea create a stunning effect - a gorgeous black look that won't go unnoticed. Versace Design Barocco and Stripes - Floral ornaments are entwined around a delicate stripey pattern on this luxurious vinyl wallpaper in a baroque style. 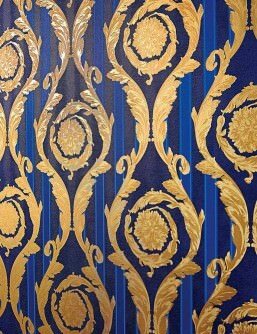 This gorgeous Versace design in blue and gold is perfectly suited to be combined with our wallpaper Nebula. Just like a painting by the old Dutch masters, our wallpaper Doriana presents us with the diversity of nature and transports us to the time of Romanticism. Tiny insects are dotted across the blossoms. The vinyl surface has a textile feel which emphasises the gorgeous floridity. Do you like the first colour combo of colourful blossoms on a black-grey background best? This glamorous glass bead wallpaper is a real sparkly gem for any home. A beautiful glass bead pattern in sparkling silver and gold is emphasised by a black background which adds extra sophistication. This iridescent composition is the perfect match for elegant floral romanticism with an exotic flair.